Pump station 19 currently services the Malloy Village subdivision, located north of Thornton Street and east of Malloy Avenue. In early 2018, the City completed the Thornton Street Sewer Extension Project. 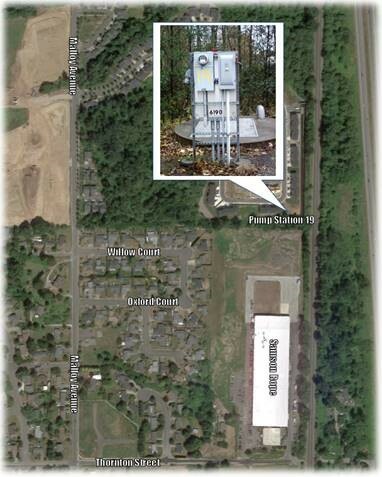 This project involved the installation of a new sanitary sewer gravity main on Thornton Street, beginning at Malloy Avenue and extending to the roundabout at Portal Way and Second Avenue via bore under BNSF Railway’s tracks. Thanks to this project, the City is now able to divert significant wastewater flows to Portal Way and Second Avenue and ease capacity issues on several segments of existing sewer collection mains (including pump station 19) located on the corridor, between Malloy Avenue and BNSF’s tracks. The project will install a new gravity sewer main, connecting Malloy Village to the new Thornton Road sewer system and allow the City to decommission pump station 19. Currently this project is scheduled for construction in 2019.